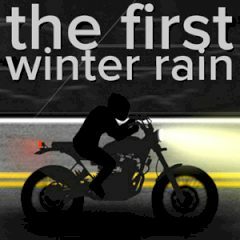 The First Winter Rain is a fantastic distance game with a relaxing music theme. Your objective is to navigate an unknown rider, called the Wanderer, through the rainy dark to the end of the track. Watch out for fuel and oncoming cars racing down the street as you switch the lane in time to avoid them or the motorcycle will be destroyed. It's highly recommended to play the game with audio for a best experience. Much fun!